We are proud to announce that the Mountain Estates Community Association has selected Tinnelly Law Group as their association’s legal counsel. 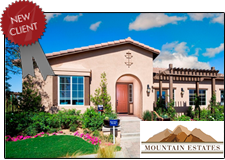 Mountain Estates is a brand new gated community in the city of Indio being developed by D.R. Horton. Mountain Estates will feature 96 spacious, single-story homes with beautiful finishes, fantastic entertaining spaces, and breathtaking mountain views. Our HOA attorneys and staff look forward to working with Mountain Estates’ Board and management.